Our 2 week Italy holiday started with us flying into Rome. We had bought Italy rail passes for the both of us. We went with the Italy Flexi pass for 2 First class saver adults for 7 days which cost us 460 Euros. For their intercity trains, you always have to make a seat reservation prior to your trip which is free of charge. You can find machines in any major train stations and do it from there. Our first day use of the pass was to get from Rome to Sorrento. There was no direct train, but to go via Naples. The train ride from Rome to Naples was 2 hours on the intercity train. You can also ride on their Frecciarossa trains which is their fast train which will only take an hour. For some of the fast trains, you may need to pay a top up on top of your Italy pass. 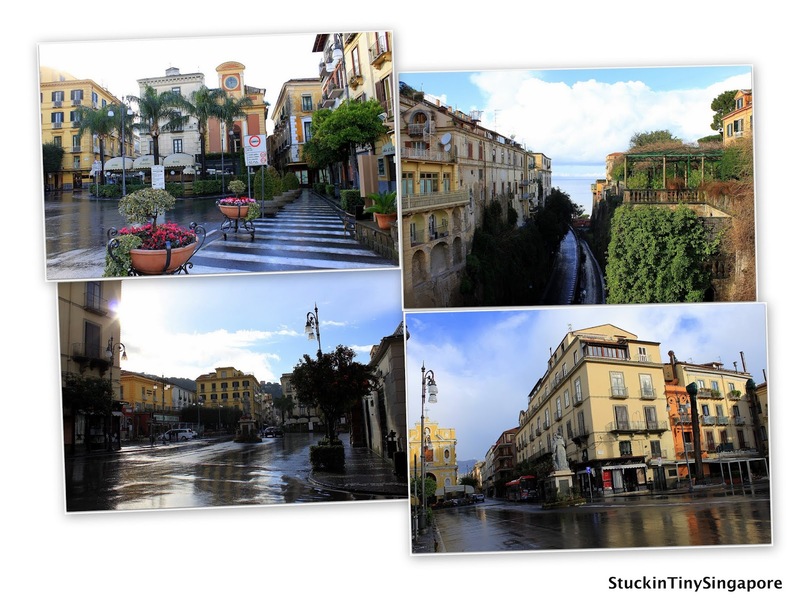 Once you get to Naples, it is easy to get to Sorrento. 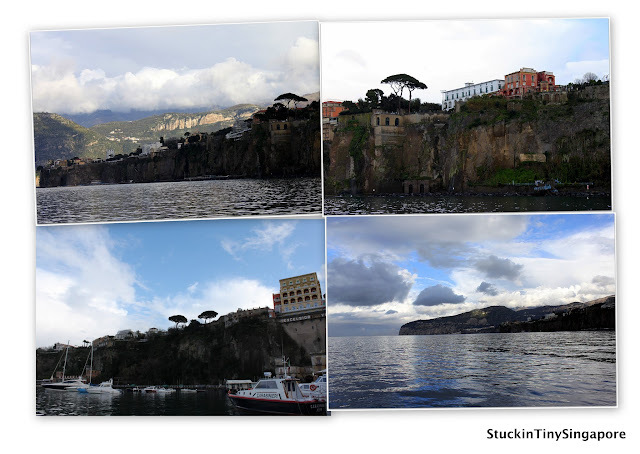 There are several ways to get to Sorrento. You can either hop on the Circumvesuviana train which runs from Naples along the coast or take a boat to Sorrento. It is slightly more expensive and faster. There is also a bus that takes you to Sorrento or the more adventurous can rent a car and drive there. We decided to go via train as since we were lugging around our bags and already on the train to Naples train station, it was much easier to hop onto another train. The Cirumvesuviana train is not covered by the Italy pass, but the fares are cheap, a simple one-way ticket will cost you less than €4. Trains from Naples to Sorrento leave from the main station (Stazione Napoli Centrale on Piazza Garibaldi) about every half-hour between 06:00 and 23:00 every day, and the journey can take between 45 minutes and 1.25 hours (again, depending on the train). If you want the quicker trip, trains marked “direttissimo” are quicker than the “diretto” trains because they make fewer stops along the way. Also note that the part of Napoli Centrale that’s dedicated to the Circumvesuviana is downstairs from the regular trains. A word of caution is pickpockets are notorious known to operate on these trains. Sometimes it can get very crowded on the trains and many unsuspecting tourists even locals have walked away with empty pockets. A tip: do get a seat on the right side of the train is you will get a fabulous view of the coastline as the train travels south towards Sorrento. For our accomodation, we got a reasonable price hotel that was situated right in the middle of Sorrento. It was a great little hotel with breakfast and wifi included. It is called Palazzo Abagnale Sorrento. Weirdly, I didn't take any photos of our room. Maybe it was because I was too excited with taking pictures outside!! Here is the photo of our room I got from the hotel's website. After we checked into our hotel, we went out to explore the town and get some dinner. We found a little quaint restaurant and had a wonderful meal. Since we went in february outside of tourist season (Summer), the town was relatively quiet, and in the restaurant there were only 3 tables of diners. Thus I didn't want to disturb the peace by snapping away with an SLR :p, so sorry folks, no pictures of food. As we wondered round the beautiful streets of Sorrento, we walked past a crowded Gelato shop. It seems most of the little tourists in town were queuing to buy their Gelato!! Being the greedy pigs, we had to stop to try!! In the shops, there were numerous pictures of famous people who had visited this little shop for their Gelato. I ended up with a Rum & Raisin while the hubby had the lemon sorbet. The town itself is up on a slope and that gives a spectacular view of the coastline. A lovely downhill stroll will take you to a pretty little small port called Marina Piccola, it is here where you can take boat trips out to see the coastline from the sea. Since it was in february, the boats operators were closed for the winter. Once will noticed that there are a lot of lemon trees and also orange trees on the streets and also along the way on the train from Naples. 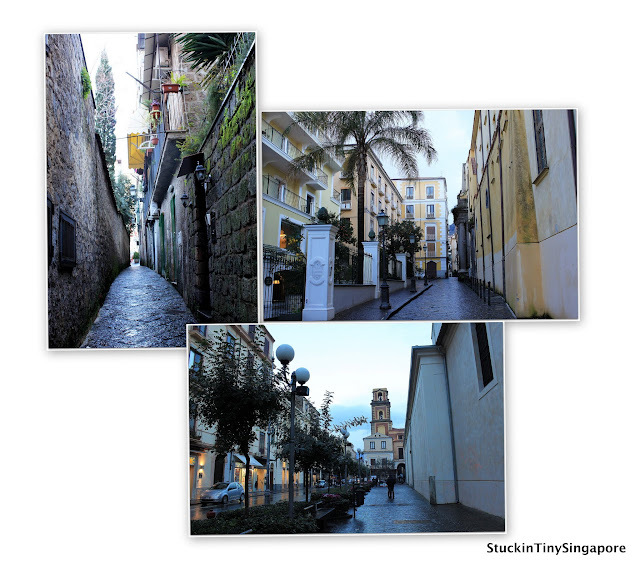 Sorrento is well known for her lemon terraces. You will find the famous product: Limoncello di Sorrento in the many souvenirs stalls in Sorrento. It is a strong liquor made from the lemon rind, a nice souvenir to bring home to friends and family. 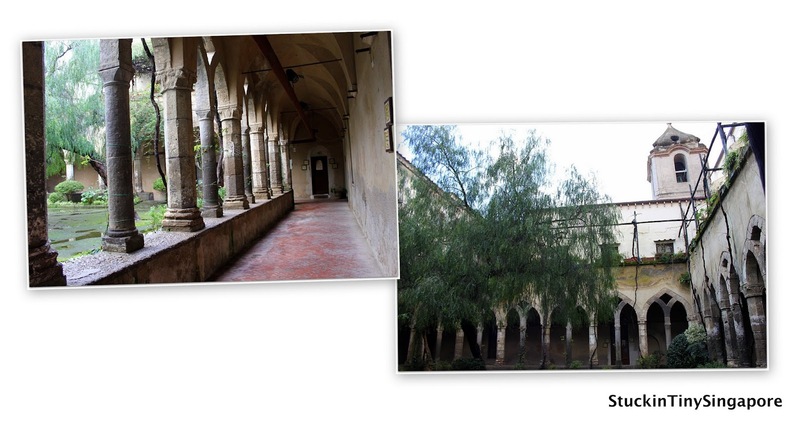 Stay tuned to part 2 of our Italy posts. If you like to follow our trip, check out the first post here. The iconic Fiat 500, the original we saw on our stroll. I want one!! !